I want to say that Incendies was robbed at the Oscars, but the fact that I’ve seen none of the other “Foreign Language”1 films, I can’t judge well, however I must state how amazing and wonderful this film is. Denis Villeneuve is not a newbie to Franco-Canadian cinema, his previous films Maelström and Polytechnique have received huge praise, which I can easily pass on to the former. I’ve yet to see Polytechnique, but I’m looking forward to that. 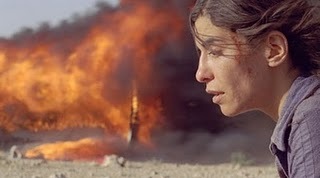 Incendies tells the story of two twenty-something twins who’s mother dies. During the reading of the will they discover her wish to have the son deliver a letter to his brother, and the daughter deliver a letter to their father. Making matters worse, they assumed their father was dead, and didn’t know they had a brother. The son, Simon, doesn’t want to play along with his mother’s game, while the daughter, Jeanne, heads to the Middle East to track down her father, brother, and her mother’s history. The film is intercut between Jeanne’s and her mother, Nawal’s journeys through war and torture, while the daughter discovers her mother’s story, the audience sees it first hand. The film is superbly written, acted, and directed, and I suggest EVERYONE see it.